A track for a stroll on the surface of Mars. 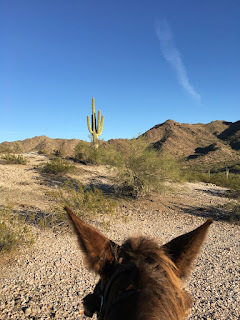 Crossing through scorched desert on trails that wind between cactus and boulders, beautiful vistas and a meditation on the consequences of drought times. But first, we begin with landmarks closer to home. 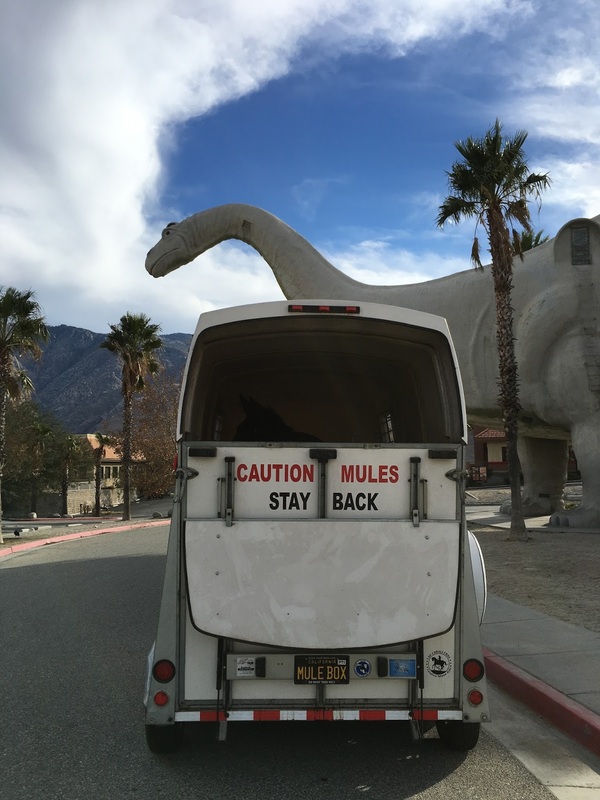 And the Cabazon Brontosaurus, an iconic statue that haunts my earliest memories. I adored visiting them during trips to the desert in childhood, and when scientists started insisting the Brontosaurus ought to be renamed A-PAT-osaurus even though that included my name I was greatly dismayed. Now in 2015 it has gone back to being a bronto, finally, the great Thunder Lizard once again. I have often thought there are two kinds of kids, gun kids and dino kids. I was a dino kid. I had the plastic models and loved the Latin names. Little did I ever expect to be trailering my own mule past there en route to an Arizona adventure. 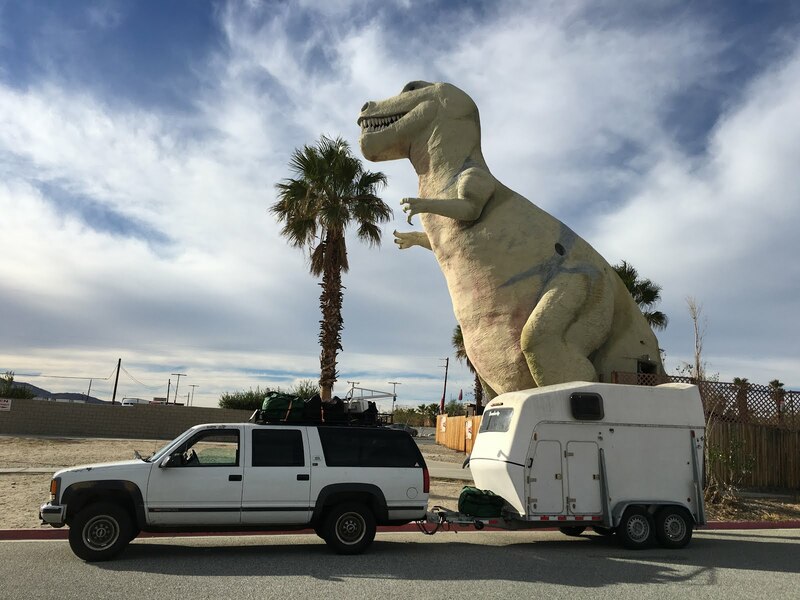 If you are traveling Interstate 10 near Palm Springs, don't miss this roadside attraction. 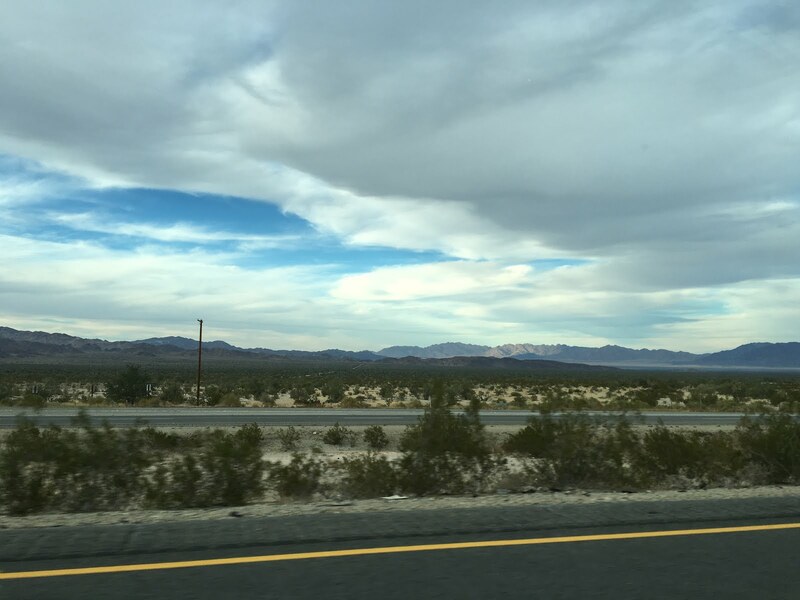 The sky changes, and the mountain silhouettes flow past on the horizon, but once you commit to traveling to Arizona you pretty much get a sense of how bad things get when the water runs out. 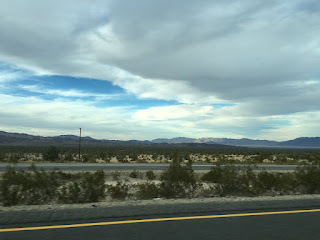 Being in the fourth year of the present drought, and knowing there have been historic dry spells that lasted ten years, I couldn't help but wonder how quickly California could see our deserts expand. I was off to ride in the epic desert of Arizona at a Max Bishop MuleSense Clinic. There's Max, out on the trail on a little Paso Fino mule he brought to the clinic. This guy is the real deal. He has the bearing and gaze that immediately let you know he has a military background, in his case Special Forces, and he works very hard to have the patience to tell the people who attend his clinics pointers to help them communicate with their equines. He does an excellent job of leading by example if you pay attention carefully enough to SEE what he is doing with the mule. 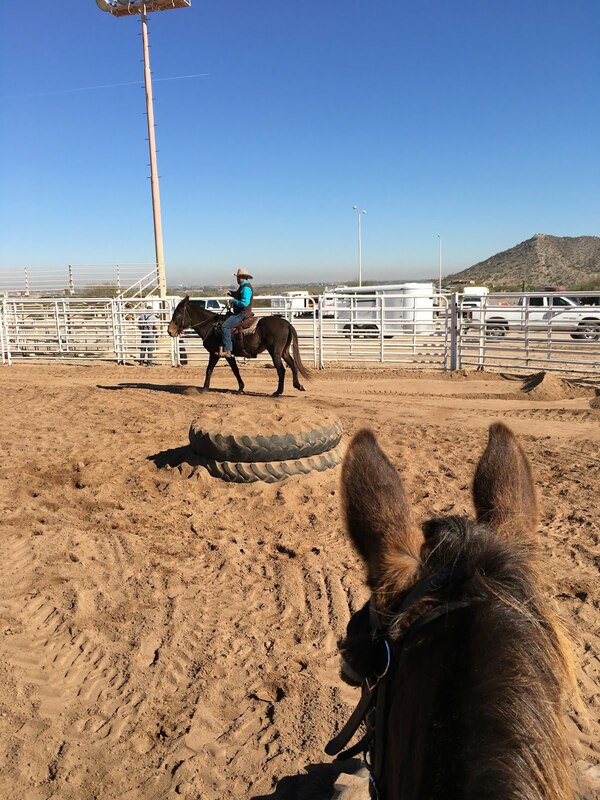 You'd think people who attend would want to learn, and want to work with their animal when he gives them drills to do or exercises to practice, but that isn't always the case. Here we are, Tobe and I, ears up and watching Max as he is talking theory while riding a mule that had been recently purchased from the Grand Canyon pack string. 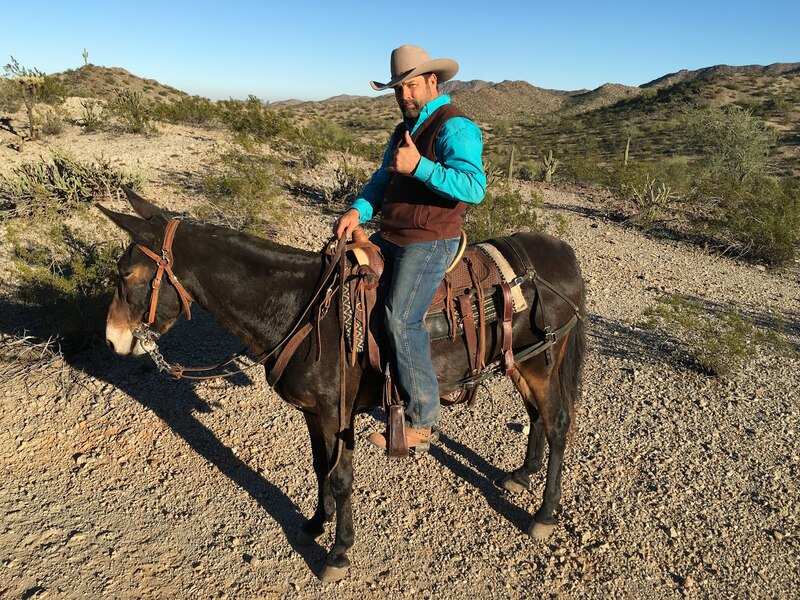 Mule riding is as much an intellectual exercise as a physical. 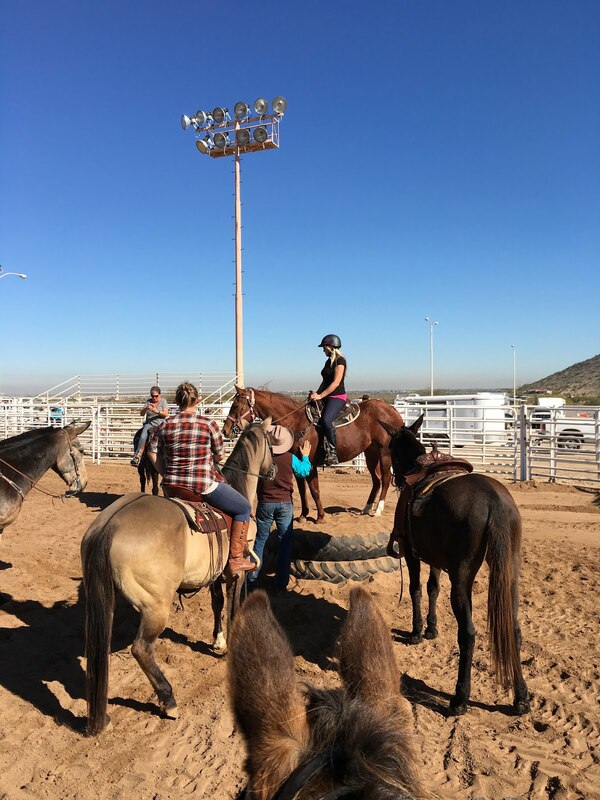 The arena at Estrella Mountain Regional Park was beautifully prepared for us, soft raked sand and BIG so we had a lot of room to move. 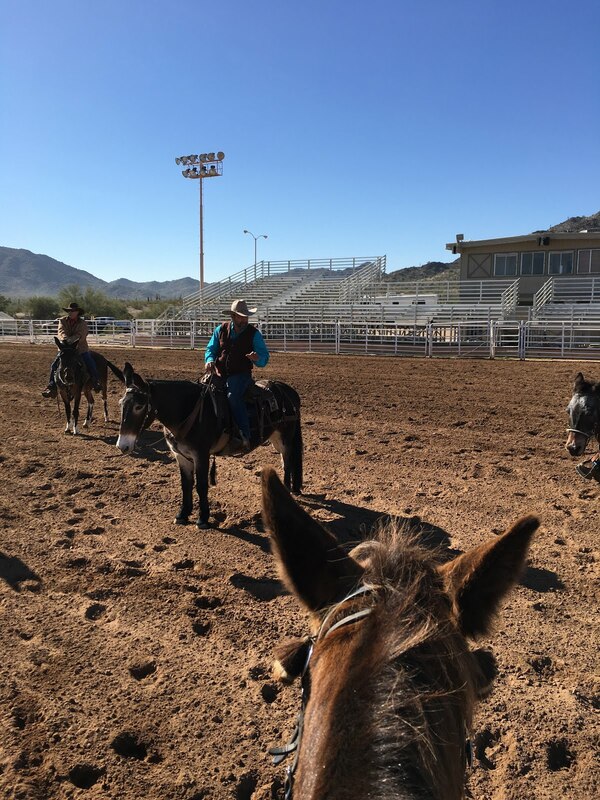 And here is Max riding a different mule, showing the owner how smooth the movement can be when directed correctly. All my recent years of working Tobe in an arena, getting the lines of communication clear and gentle, really showed to good effect here. We understood what he was saying, and we did the exercises he suggested successfully. Max is all about extreme riding. So he works in his clinics to get people to do things they would otherwise not attempt, knowing that after they have done them their confidence level in both themselves and their animals will increase. A good example is this set of gigantic tractor tires he had the arena staff fill with sand and pound down to make a platform for the mules to jump up on. 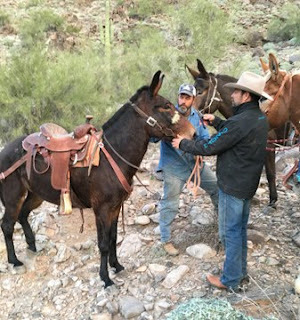 One mule was engaged in a battle royal for over an hour the first day, but he did eventually do it. Watching was fascinating, as Max directed his helper and others to drag up a roped forehoof onto the tires and then encourage the mule to follow through and jump up. Over and over the animal refused, but the humans outlasted him and he finally overcame his fear and did it. Tobe watched for a while, and we both saw what was being asked for, and then we did it !!!!! Mules can learn by watching so I knew when I went to ask him to jump on it he knew what I was asking for, I just had to convince him that it was going to happen. He feinted off to the side repeatedly, but I was persistent, and finally he jumped up just to stop the aggravation. The second day we went to the tires and he went right up and stayed there, as asked, until told to get down. Giving him overnight to "soak on it" was enough to convince Tobe that it was something he could and would do easily. The clinic participants worked their animals on the tires one by one, some creatures taking a lot longer than others. Max got this big mule to get his forelegs on it and then did a bit of a circus acrobat trick. He told us some tales of his "other life" training mixed martial arts fighters, and with displays like this it was easy to see his balance and strength are the foundations of his courage. But we came to ride! 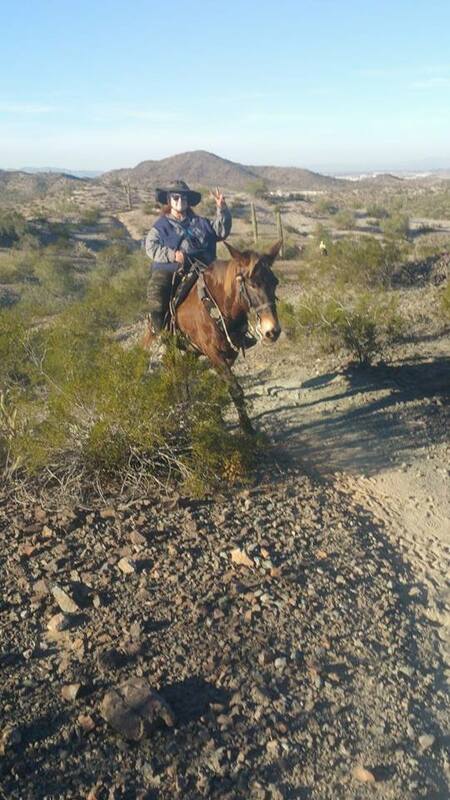 So it was lovely that after a morning in the arena it was time for a trail ride after lunch. 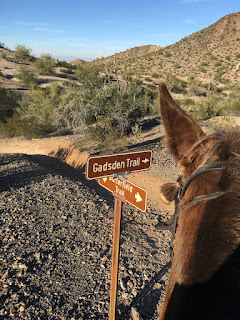 My fondness for the Gadsden Flag made me very happy when I saw that one of the trails we went on was named Gadsden. 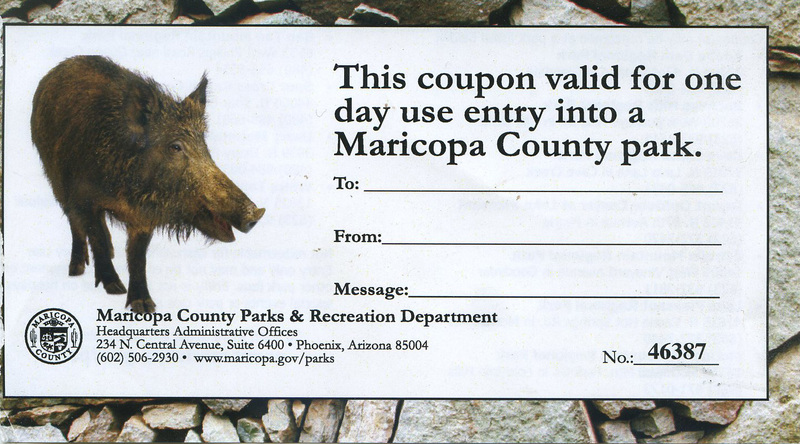 The park is well laid-out with lots of trails, easily marked. I prefer, when possible, to ride up front in a group. Less dust in my face, but also the person whose riding I want to be watching is the trail boss. And I'd prefer not to be chattering with people, I want to "Ride alone in a group" as I have been taught. Use the group for security, but actively ride, paying attention to the trail hazards and being a participant partner with Mr Mule. And in this environment a big hazard is the teddy bear cholla, Cylindropuntia bigelovii, The cactus in the photo above that almost seems to glow is the one to watch out for. Most stands of it were off the trail, but certainly close enough that an inattentive rider might let their animal drift to the side of the trail and encounter the spines, which would drive deep into the hide and cause a strong adverse reaction. 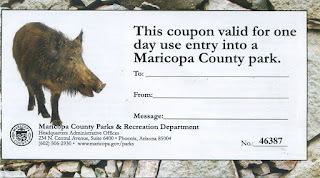 There were also big sections of jumping cholla, Cylindropuntia fulgida, that has sections so tenuously attached as to seem to be capable of jumping onto an animal's legs or a human's clothing. All of this means I am an observant and active participant in the ride, asking Tobe to sidepass over and away from anything I consider a potential threat. He knows quite well how far away he has to be to not brush his own legs or belly up against a cactus, but I sometimes need to ask for those extra inches to keep my own leg clear. Max scouted off ahead and had just such an encounter. He went to check out an area where I declined to follow, because i did the quick decision that Tobe and I might well be injured and I had nothing to prove. The rest of the group tagged along with Max, and his apprentice Chris Adams stayed behind with me. I likely could not have stayed if he hadn't, so I was very grateful. If every equine had left, well, Tobe likes me but he believes in herd psychology and I would not likely have been able to hold him back. 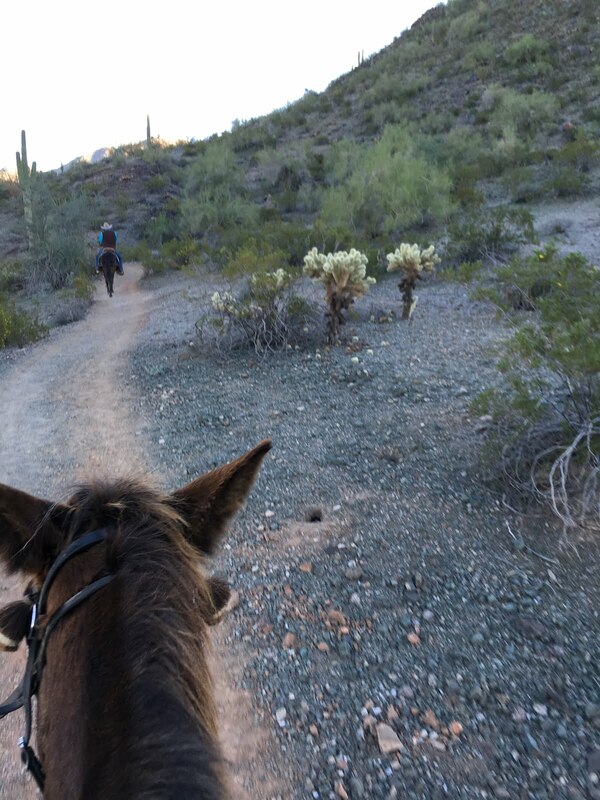 So Chris and I watched, and waited, and finally we saw Max coming back very slowly, leading his Paso mule. Funny thing, at that moment all my hesitancy about risk factors fled, when I thought that Max might be injured or needing help. 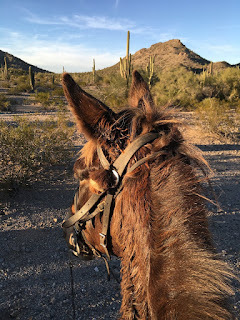 Chris and I hastened up to him and found him with a mule in distress, with a massive cholla stuck to her nose. With Chris helping to hold the mule's head still, Max was able to remove the spines one by one with needle-nose pliers, and the mule fretted but seemed to understand that these humans were the way to relief from the pain. I can't help but think a horse in the same situation would be in a blind panic, but the mule patiently let Max get the spines out before they began to fester. While waiting for this drama to unfold Tobe and I surveyed the landscape. 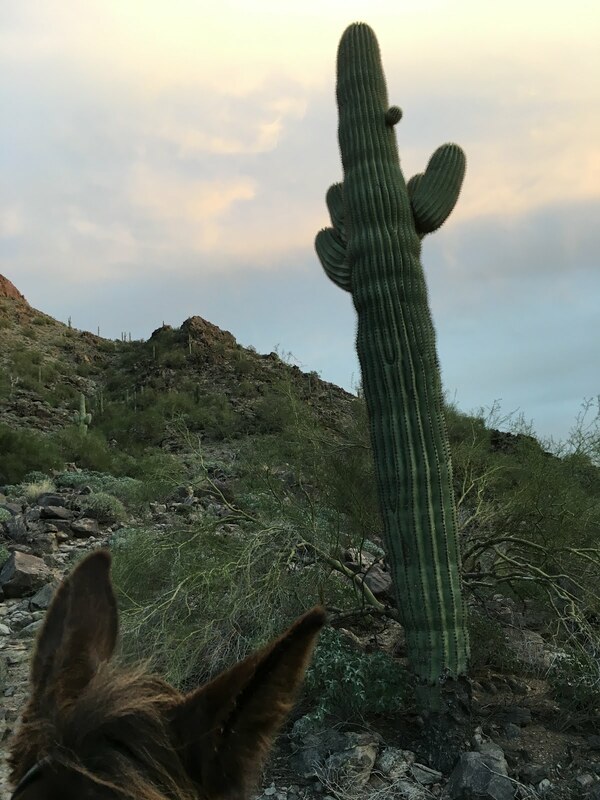 Right next to us was a saguaro cactus, Carnegiea gigantea, the signature species of this part of the American Sonoran desert. They are ancient individuals, they don't even start to grow a first arm until they are 75-100 years old. Their presence on the high ridges standing sentinel to the passage of time causes the theme music to endless cowboy westerns to cue up in nostalgic revery. This con trail was likely from maneuvers being conducted at the nearby Air Force Base. At my hotel every morning I was surprised to be accompanied while eating the complementary breakfast by a mass of identically uniformed tiny Asian men who explained they were from the Singapore Air Force. 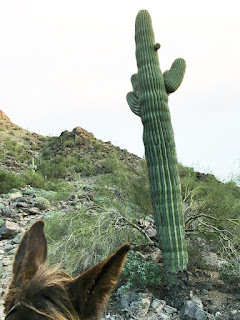 They told me they were here to fly helicopters and jets, and several times while we mule riders tracked slowly down the trails on the ground we were buzzed by them overhead. One had a name tag with his English nickname "Crypto." I couldn't help but contrast their view of the desert from high above with mine, moving so carefully below. Another kind of cactus that we passed a lot of were ocotillo, Fouquieria splendens. I liked lining up Tobe's forelock with the fanned branches for this photo. At this time of year they look like long-dead spiny sticks, but if there is a rainfall they burst into a coral red bloom. The sun was setting, so it was time to turn back to the arena pens and give the mules a well deserved rest and dinner and water. 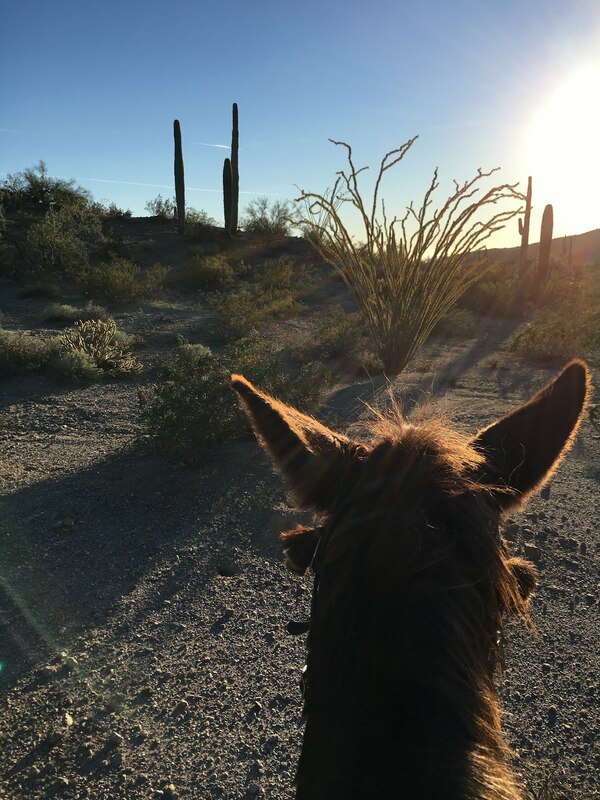 Once again my marvelous AniMule was my stalwart companion for a journey of exploration. 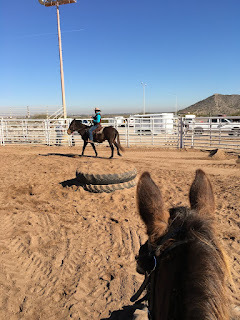 I was very proud of him, he gave every exercise and learning experience his best effort, and we worked as a calm and confident team together. 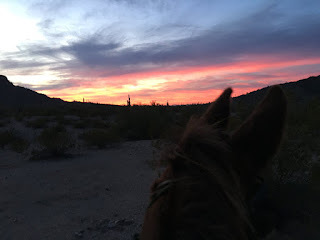 Max took apart the way I had my rigging done on my saddle, and explained why an alternative system of strapping up the britchen and breast collar would make it safer for me and more comfortable for Tobe. I am very grateful for this knowledge and will be making those changes immediately. And the one behavior issue I had, Tobe showing cranky dominance on the ground after rides, well, heck. Max set me right about that too. He watched me work with Tobe and explained the precise moment when Tobe "punked me out" and got the upper hand. Now that I see how it was happening I can take responsibility for changing my own behavior to make sure that bad habit is corrected and does not continue to build. 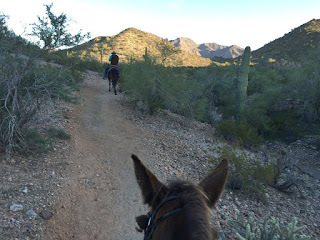 I understand that Tobe does the hardest work on the trail, but he was getting a bit pushy with me as I took off the saddle, telling me to hurry up. And now I have the awareness to nip that as soon as he starts it, because it is unworthy of how well we work together the rest of the time. 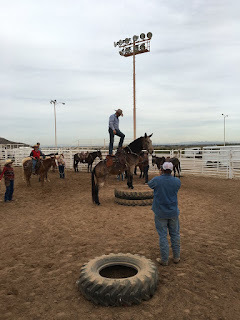 We had three days of lessons and rides, that I have condensed here. 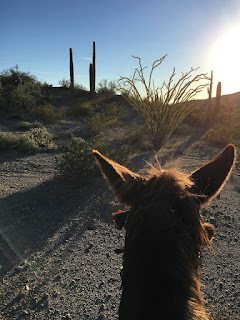 Then it was time to load up and once again make the trek back to the edge of the continent, where more mule adventures await us.